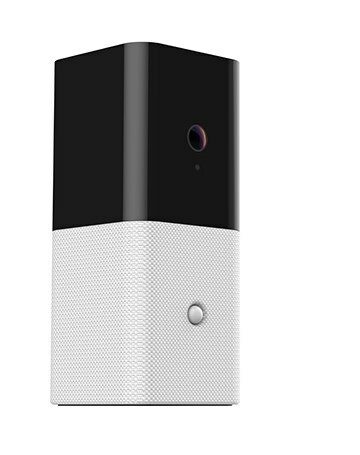 Las Vegas, NV – January 8, 2018 – abode systems, a leader in DIY smart home security, today announces iota, a new all-in-one DIY home security system designed to give customers the freedom and flexibility to build out and monitor their smart home their way. The new form factor includes a built-in full HD resolution camera that enables customers to see and hear what’s going on in their home 24/7 while a built-in gateway with Z-Wave, ZigBee and abode RF connectivity supports hundreds of devices that help make homes more convenient, safer and secure. Also featuring support for Apple HomeKit, iota is one of the first DIY security solutions to work with Apple’s smart home platform, enabling simple and secure control via the Apple Home app, Siri or automatically. iota also features integration with Amazon Alexa and Google Assistant. Built on top of abode’s robust home automation and rules engine, iota users can customize notifications from the app to get alerts on the events that matter the most. Much more than just a system to protect consumers from intruders, abode can let users know when kids arrive home, the dog walker came and went, or just a sense of who is home when they are not. The sleek, fabric-wrapped cylindrical gateway comes equipped with a built-in 1080p camera, and can sit anywhere in the home to keep an eye and ear on things. Live video can be accessed anytime via the abode web, Apple Home app, or abode’s Android and iOS app or, in the event of an alarm, the system will automatically upload clips to the abode timeline regardless of abode plan. Video clips can also be triggered by other events within the home, such as unlocking the front door and integrated infrared LEDs provide night vision capabilities in the dark. The on-board Wi-Fi and Ethernet allow customers to take advantage of wireless functionality or plug directly into a home router. Out-of-the box, iota will include a robust home automation engine with native app support for major smart home brands including Nest and ecobee and local, direct integration with Philips Hue and LifX, Additionally, the abode platform boasts compatibility with the entire ecosystem of abode smart home devices and thousands more thanks to integrated Z-Wave and Zigbee connectivity. iota gives customers the flexibility to connect the smart home devices they want, such as smoke detectors, water leak detectors and water shut off valves, connected lighting, garage door openers, door locks, or smart appliances to truly customize their smart home security experience. For consumers looking for pro-level monitoring either short term or ongoing, abode offers flexible, on-demand plans that require no monthly contract or long-term commitments. Users can activate professional monitoring through the patented on-demand feature in their mobile app and be protected by a UL-Listed monitoring center. Plans are available in three or seven-day increments for quick vacations and trips, or on a monthly and annual basis. Integrated battery backup ensures iota stays connected even in 10+ hour power outages and optional 4G/LTE cellular backup is available as an add on to ensure iota stays connected at all times. For existing customers interested in upgrading to the iota gateway, abode will provide additional details on an upgrade path and system transfer program to help re-sync abode devices to their new gateway in the coming months. The new iota DIY home security system will be shown off in the Z-Wave Pavilion on the second level of the Sands in booth #41717. iota will be available in Q1 2018 with an expected MSRP of $329.